This document was developed through the HTML Media Task Force and is published by the HTML Working Group as a Last Call Working Draft. If you wish to make comments regarding this document in a manner that is tracked by the W3C, please submit them via using our public bug database with the Component field set to “Media Source Extensions”. If you cannot do this then you can also e-mail feedback to public-html-media@w3.org (subscribe, archives), and arrangements will be made to transpose the comments to our public bug database. All feedback is welcome. In order to be considered under the W3C Last Call Process, bugs must be filed or email sent to the mailing list by 17 October 2013. Significant changes between successive public drafts are tracked in the Revision History section. This document is intended to become a W3C Recommendation, either on its own or merged into an HTML Recommendation. Publication as a Last Call Working Draft does not imply endorsement by the W3C Membership. This is a draft document and may be updated, replaced or obsoleted by other documents at any time. It is inappropriate to cite this document as other than work in progress. A presentation timestamp range used to filter out coded frames while appending. The append window represents a single continuous time range with a single start time and end time. Coded frames with presentation timestamps within this range are allowed to be appended to the SourceBuffer while coded frames outside this range are filtered out. The append window start and end times are controlled by the appendWindowStart and appendWindowEnd attributes respectively. A unit of media data that has a presentation timestamp and decode timestamp. The presentation timestamp indicates when the frame must be rendered. The decode timestamp indicates when the frame needs to be decoded. If frames can be decoded out of order, then the decode timestamp are present in the byte stream. The user agent must run the end of stream algorithm with the error parameter set to "decode" if this is not the case. 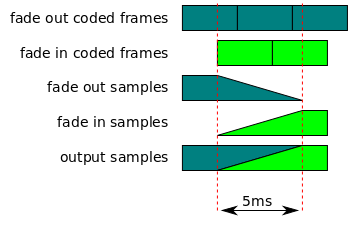 If frames cannot be decoded out of order and a decode timestamp is not present in the byte stream, then the decode timestamp is equal to the presentation timestamp. A group of coded frames that are adjacent and monotonically increasing in decode time without any gaps. Discontinuities detected by the coded frame processing algorithm and abort() calls trigger the start of a new coded frame group. The delay, to the nearest microsecond, between a frame's presentation time and the actual time it was displayed. This delay is always greater than or equal to zero since frames must never be displayed before their presentation time. Non-zero delays are a sign of playback jitter and possible loss of A/V sync. The origin of the MediaSource object URL is specified by the Origin of Blob URIs [ FILE-API ]. The media element waits for the necessary media segments to be passed to appendBuffer() or appendStream(). 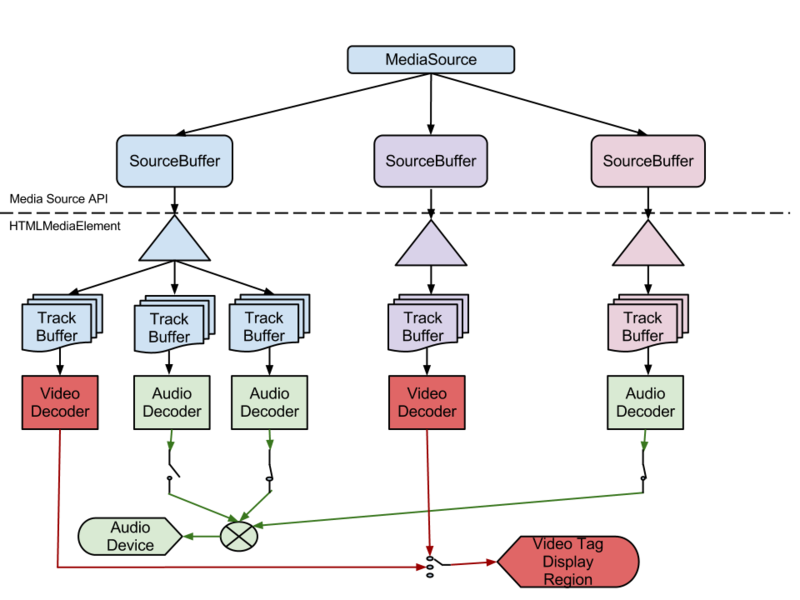 The media element feeds coded frames from the active track buffers into the decoders starting with the closest random access point before the the new playback position. Update new duration to the highest end timestamp across all SourceBuffer objects in sourceBuffers. The presentation timestamp for the start of the append window. This attribute is initially set to 0. Controls how a sequence of media segments are handled. This attribute is initially set to "segments" when the object is created. If new mode does not equal "segments" or "sequence", then throw an INVALID_ACCESS_ERR exception and abort these steps. If the new mode equals "sequence", then set the group start timestamp to the highest presentation end timestamp. Each track buffer has a last frame duration variable that stores the frame duration of the last coded frame appended in the current coded frame group. The variable is initially unset to indicate that no coded frames have been appended yet. The highest presentation end timestamp variable stores the highest presentation end timestamp encountered in the current coded frame group. It is set to 0 when the SourceBuffer object is created and gets updated by the coded frame processing algorithm. For example, MediaSource.isTypeSupported('video/web;codecs="vp8,vorbis"') may return true, but if addSourceBuffer() was called with 'video/web;codecs="vp8"' and a Vorbis track appears in the initialization segment, then the user agent may use this step to trigger a decode error. Loop Top: Let presentation timestamp be a double precision floating point representation of the coded frame's presentation timestamp in seconds. Special processing may be needed to determine the presentation and decode timestamps for timed text frames since this information may not be explicilty present in the underlying format or may be dependent on the order of the frames. Some metadata text tracks, like MPEG2-TS PSI data, may only have implied timestamps. Format specific rules for these situations should be in the byte stream format specifications or in separate extension specifications. Set highest presentation end timestamp equal to group start timestamp. If the presentation timestamp or decode timestamp is less than the presentation start time, then run the end of stream algorithm with the error parameter set to "decode", and abort these steps. Set highest presentation end timestamp to presentation timestamp. Set group start timestamp equal to the highest presentation end timestamp. If highest presentation end timestamp is unset or frame end timestamp is greater than highest presentation end timestamp, then set highest presentation end timestamp equal to frame end timestamp. Let overlapped frame be the coded frame in track buffer with a presentation timestamp less than or equal to presentation timestamp and presentation timestamp is less than this coded frame's presentation timestamp plus its frame duration. Let first overlapped frame be the coded frame in track buffer with a presentation timestamp less than or equal to presentation timestamp and presentation timestamp is less than this coded frame's presentation timestamp plus its frame duration. Update the frame duration of the first overlapped frame to presentation timestamp - overlapped presentation timestamp. Queue a task to fire a simple event named change at the AudioTrackList object referenced by the audioTracks attribute on the HTMLMediaElement. Queue a task to fire a simple event named change at the VideoTrackList object referenced by the videoTracks attribute on the HTMLMediaElement. Queue a task to fire a simple event named change at the TextTrackList object referenced by the textTracks attribute on the HTMLMediaElement. The bytes provided through appendBuffer() and appendStream() for a SourceBuffer form a logical byte stream. The format of this byte stream depends on the media container format in use and is defined in a byte stream format specification. Byte stream format specifications based on WebM , the ISO Base Media File Format, and MPEG-2 Transport Streams are provided below. These format specifications are intended to be the authoritative source for how data from these containers is formatted and passed to a SourceBuffer. If a MediaSource implementation claims to support any of these container formats, then it must implement the corresponding byte stream format specification described below. The byte stream format specifications below are not intended to define new storage formats. They simply outline the subset of existing storage format structures that implementations of this specification will accept. The user agent must accept and ignore any elements other than an EBML Header or a Cluster that occur before, in between, or after the Segment Information and Tracks elements. The Timecode element must appear before any Block & SimpleBlock elements in a Cluster. Block & SimpleBlock elements are in time increasing order consistent with the WebM spec. The user agent must accept and ignore Cues or Chapters elements that follow a Cluster element. An ISO BMFF initialization segment is defined in this specification as a single Movie Header Box (moov). The tracks in the Movie Header Box contain samples (i.e. the entry_count in the stts, stsc or stco boxes are not set to zero). A Movie Extends (mvex) box is contained in the Movie Header Box to indicate that Movie Fragments are to be expected. The user agent must handle Edit Boxes (edts), in initialization segment, which provide a mapping of composition times for each track to the global presentation time. The user agent must support parameter sets (e.g., PPS/SPS) stored in the sample entry (as defined for avc1/avc2), and should support parameter sets stored inband in the samples themselves (as defined for avc3/avc4). For maximum content interoperability user agents are strongly advised to support avc3/avc4. The Movie Fragment Box does not contain at least one Track Fragment Box (traf). The Movie Fragment Box does not use movie-fragment relative addressing or the flag default-base-is-moof is not set. External data references are being used. The Media Data Boxes do not contain all the samples referenced by the Track Fragment Run Boxes (trun) of the Movie Fragment Box. Inband parameter sets are not present in the appropriate samples and parameter sets are not present in the last initialization segment appended. Segments do not contain complete MPEG-2 TS packets. Segments do not contain complete PES packets and sections. Segments contain more than one program. At least one MPEG-2 TS packet has a non-zero transport_error_indicator. An MPEG-2 TS initialization segment consists of a single PAT and a single PMT. The user agent must accept and ignore other SI, such as CAT, that are invariant for all subsequent media segments. A media segment relies on initialization information in another media segment. At least one PES packet does not have a PTS timestamp. PCR is not present in the Segment prior to the first byte of a TS packet payload containing media data. The user agent will accept and ignore PSI that is identical to the information in the last initialization segment which may appear repeatedly throughout the segment. The editors would like to thank Alex Giladi, Bob Lund, Cyril Concolato, David Dorwin, David Singer, Duncan Rowden, Frank Galligan, Glenn Adams, Jerry Smith, Joe Steele, John Simmons, Kevin Streeter, Mark Vickers, Matt Ward, Michael Thornburgh, Philip Jägenstedt, Pierre Lemieux, Ralph Giles, and Steven Robertson for their contributions to this specification.